This hit series spins NCIS in an all-new direction-undercover-in this set of 24 Season One episodes on 6 discs. The Office of Special Projects is an elite unit that uses high-tech surveillance and high-stakes action to apprehend criminals who threaten national security. With the ability to assume any identity to infiltrate criminal organisations, Special Agent "G" Callen (Chris O'Donnell) is the unit's top investigator - a reputation th..
Just when you think you've uncovered the truth, the truth goes undercover in the action-packed second season of NCIS: Los Angeles. As Special Agent "G" Callen (Chris O'Donnell) wrestles with the demons of his past, he must lead the team, including his ex-Navy SEAL partner Sam Hanna (LL Cool J), Special Agent Kensi Blye ( Daniela Ruah), and LAPD Detective Marty Deeks (Eric Christian Olsen), on a whirlwind chase of ruthless terrorists, mi.. Season 3 of NCIS: Los Angeles hits the ground shooting as the team lands in Romania to rescue their boss and friend, Hetty Lange (Oscar winner Linda Hunt), from a ruthless crime family. But Hetty's mission is as much personal as it is professional, revealing a bombshell secret about team leader "G" Callen's (Chris O'Donnell) past. This secret culminates in the team's first-ever collaboration with Hawaii Five-0, in a joint effort to prev.. The Fourth Season of NCIS: Los Angeles finds the unit in crisis, with team leader Callen (Chris O'Donnell) accused of murdering a suspect in cold blood. The danger mounts as operations manager Hetty Lange (Oscar winner Linda Hunt) faces threats from her past. The team endures, only to uncover a secret that could jeopardise the people closest to former Navy SEAL Sam Hanna (LL Cool J). In a crisis-level case, the team crosses paths with t.. In the high-octane drama NCIS: Los Angeles, Season Five raises the threat level for the nation's most elite squad of agents. Team leader Special Agent "G" Callen (Chris O'Donnell) and his partner Sam Hanna (LL Cool J) - a former U.S. Navy SEAL who's seen action in both Afghanistan and Iraq - are chameleons who have mastered the art of undercover operations. Alongside Callen and Sam are Special Agent Kensi Blye (Daniela Ruah), LAPD liais.. 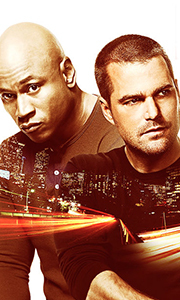 Agents “G” Callen (Chris O’Donnell) and Sam Hanna (LL Cool J) ratchet up the action in the seventh adrenaline-charged season of NCIS: Los Angeles. Together with Special Agent Kensi Blye (Daniela Ruah), LAPD Detective Marty Deeks (Eric Christian Olsen), computer whiz Eric Beale (Barrett Foa) and expert analyst Nell Jones (Renee Felice Smith), this A-list crew fearlessly takes on international and domestic enemies, including North Korean ..
Own NCIS Los Angeles Season 8 DVD from Deff, DVD, Blu-Ray & 4K Video Specialists - Free UK Delivery..
Own NCIS Los Angeles Season 6 DVD from Deff, DVD, Blu-Ray & 4K Video Specialists - Free UK Delivery..